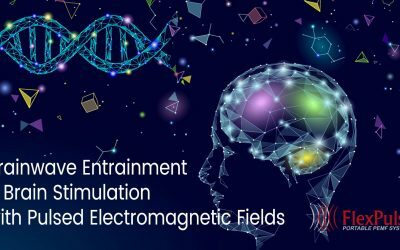 PEMF (Pulsed electromagnetic field) therapy is a therapeutic use of pulsating magnetic fields and is applied using PEMF devices. Nothing happens in the body without an electromagnetic exchange between cells. Natural electromagnetic energy controls our chemistry. When this energy is disrupted (by a bruise or traumatic injury, a tough workout, bad diet, or simply from getting older), our cells are impaired. When your cells aren’t healthy, your body isn’t healthy, in whole or in part. By introducing a complementary electromagnetic ﬁeld into the body, you can reestablish healthy electromagnetic exchanges. This is why PEMFs (Pulsed ElectroMagnetic Fields) are so valuable – they stimulate all levels of the body. They are applied externally, and then fully penetrate the body, affecting individual cells and therefore tissues, organs, and complete body systems. There are at least 800 peer-reviewed papers supporting the fact that electrical shock and electrical currents can induce signiﬁcant acceleration of repair in bone and other tissues (tendon and ligament). But the problem has always been (a) locating electrodes close enough to the tissues to be stimulated electrically, and (b) the fact that free electrical current follows a random path of least resistance. 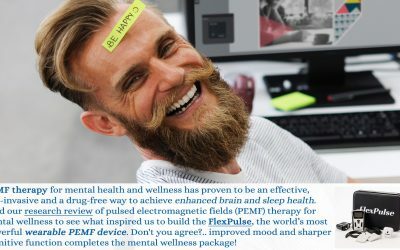 PEMF systems like the FlexPulse PEMF device solve these problems by using magnetic ﬁelds as opposed to direct electrical ﬁelds. 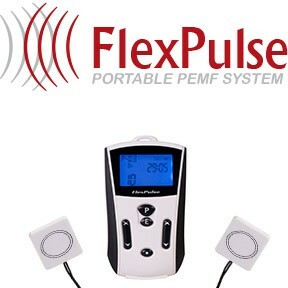 The FlexPulse™ magnetic ﬁeld generates a pulsed electromagnetic ﬁeld at all levels of the tissues in the right range of ﬁeld strength and duration to provide a cellular response much more safely than conventional electrotherapy. What types of conditions can be treated with PEMF Therapy? PEMF therapy can be used by almost anyone to help with almost any condition or problem. Because magnetic ﬁelds affect us on a cellular level, they are not condition-speciﬁc. PEMF therapy has been shown to decrease inﬂammation, increase circulation, enhance muscle function, speed up bone healing, reduce the effects of stress, and improve blood oxygenation, among a myriad of other things. 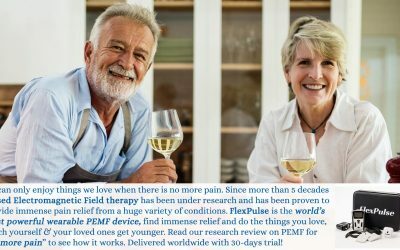 The variety of programs in the FlexPulse™ means it will be effective from everything from wound healing (anything from a bruise to an organ dysfunction) to quieting down an overactive mind, and almost everything in between. Below PEMF therapy research articles attempt to educate about the benefits of PEMF therapy for a variety of conditions. We hope this information helps you learn more about effects of pulsed electromagnetic field therapy and how it can be applied to help you feel and perform better. The only absolute contraindication for use of the FlexPulse™ is placing the applicators over implanted electrical devices like pacemakers, cochlear implants, intrathecal pumps, etc, because the magnetic ﬁeld can shut the device off. Beyond that, the FlexPulse is safe for use over the heart (in fact, research has shown beneﬁt to congestive heart failure, A-Fib, etc), over the brain, over the eyes (a common use is for treatment of macular degeneration), directed at the prostate, etc. Safety of PEMFs has not been established in pregnancy, although there is no evidence of harm either. They should be used with caution in Grave’s disease or active bleeding.